A Colorado electric cooperative filed with state regulators Thursday to ditch its coal-heavy generation supplier in pursuit of cheaper renewable energy, part of an industry-wide move toward wind and solar. The Delta Montrose Electric Association (DMEA) asked the Colorado Public Utilities Commission to adjudicate a fair exit price to end its generation contracts with the Tri-State Generation & Transmission Association, a multi-state power provider that requires member utilities to purchase 95% of their power from its largely fossil fuel fleet. DMEA's exit could prompt moves from other Tri-State members, who have pressured the utility in recent years to allow more local renewable energy investment. Two of Tri-State's rival utilities in Colorado this week pledged to move to 100% clean energy, and a recent economic analysis of Tri-State's fleet suggests wind and solar could undercut its existing coal plants. DMEA's decision to leave Tri-State demonstrates how the increasing competitiveness of renewable energy is upending the economics of power production in the American West. Tri-State is a generation and transmission provider that supplies power to more than 40 rural cooperatives across Colorado, Nebraska, New Mexico and Wyoming. While it has increased renewable energy in recent years, coal is still its largest source of electricity — around half its capacity — and member co-ops are required to purchase all but 5% of their power from the company. In a statement Thursday, DMEA officials said their primary motivator for splitting from the generation supplier is to limit costs to their customers. "Tri-State's annual reports show that average member rates have increased 56% since 2005, which is more than double the increase in the Consumer Price Index over the same time period," the co-op said. "This stands in stark contrast to the overall energy market in which prices have decreased significantly over the same period." Recent analysis from Rocky Mountain Institute illustrates the decreasing competitiveness of Tri-State's coal plants. 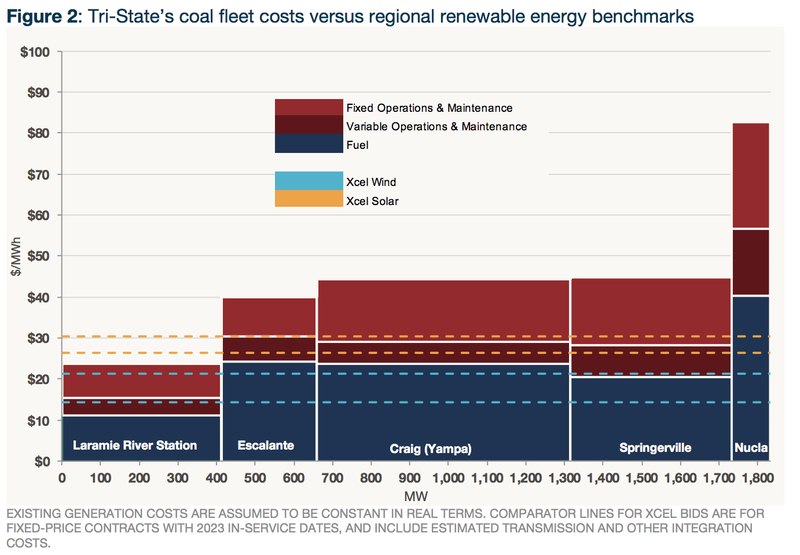 The clean energy think tank compared the costs of five large Tri-State facilities with recent solicitations for wind and solar from Xcel Energy, an investor-owned utility in Colorado, finding that the renewables could be cheaper than all of them. Xcel announced this week it would take advantage of those economics to transition to 100% clean energy by 2050, part of its "steel for fuel" strategy that replaces fossil resources with wind and solar. It was joined days later by the Platte River Power Authority, which pledged to meet the same target two decades earlier. The low cost renewable energy contracts fueling those pledges have not gone unnoticed by Tri-State co-op members in Colorado. In a Nov. 27 letter to Tri-State management, co-op United Power explicitly references Xcel's prices in its request to generate more local renewable energy. "Since United Power abuts Xcel Energy's service territory in many locations and competes with Xcel Energy for large industrial loads, competitive pricing for power is paramount for United Power," the co-op wrote. "Unfortunately, we have discovered that Xcel Energy's wholesale combined demand and energy charge, for the amount of energy that United Power currently uses on an annual basis is 28.5% lower than Tri-State's … charge." A successful split from Tri-State could embolden members like United — Tri-State's largest customer — to follow DMEA's lead. DMEA on Thursday asked state regulators to determine a fair exit charge for the co-op, arguing that the price Tri-State requests is unjust and unreasonable. "DMEA requests that, based on expert testimony that will be filed early in 2019, the PUC determine a just, reasonable, and nondiscriminatory exit charge so that DMEA pays its fair share, but no more, in exiting Tri-State," the co-op wrote in a fact sheet supplied to Utility Dive. Regulators will have recent precedent to consider in determining that charge. In 2016, New Mexico's Kit Carson Electric Cooperative split with Tri-State after a lengthy battle over renewable energy development — a move it expects will save its 30,000 customers $50 million over ten years. Like Kit Carson, DMEA plans to purchase its power from the wholesale electricity supplier Guzman Energy after leaving Tri-State. "Guzman Energy helped bring significant economic benefits to [Kit Carson's] service territory," DMEA officials wrote, "including a plan to add 35 MW of local solar development which created millions in local economic benefit and a substantial number of local jobs."